Time for more 0-1 kcal tea! 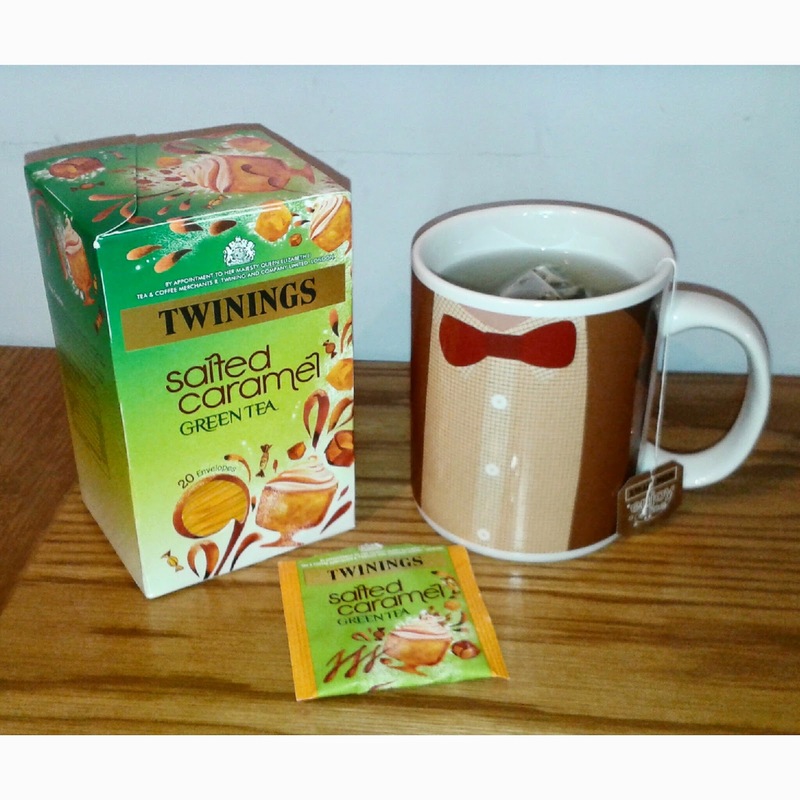 This time it is Salted Caramel Green Tea from Twinings. Check out the gorgeous packaging! Mmmm! I'd love to illustrate groceries labels one day! Upon pouring water over the teabag the smell hit me like a bus. It. Smells. Amazing. It made the whole room smell amazing. But that's how they get you! Cheeky teas. At first it just tasted of green tea, but the more sips you take the more you taste the salted caramel. Eventually it just tastes like green tea with a bit of sweetness which makes it very drinkable... once you're drinking it. In all honesty I think I'd rather just smell it. This seems to be more for already established fans of green tea. I'm sure the more I drink various flavoured green teas the more I will grow to like it and probably even love it. It's no secret that green tea takes some getting used to! I used to drink straight green tea every day, so I'm sure if I stole the TARDIS and dropped some off, 19 year old me would love it! Alas, it is not sweet enough to replace my milky, sugary, normal tea. If you have any flavoured teas you'd recommend please let me know in the comments so I can try them! Oh no, I had such high hopes for this when I saw you post it on Instagram :( Oh well, fingers crossed the other one you bought is nicer. I've been loving the 'Calm' tea from Whittards of Chelsea lately, and for the past few months have enjoyed Twinings Spiced Apple and Chamomile and Settling Ginger. It's only beed a few months that I started drinking tea, I never liked it before. P.s. Your mug is awesome! I was hoping for great things too! I really do need to buy some flavoured tea that isn't flavoured greed tea. Do apple and chamomile go to together then? Is the ginger with the apple and chamomile or a separate tea? Arrrrrgh! Milky, sugary, tea!!! No! No! No! Mum used to give it to me for tummy ache, is Camomile! I really shall remember to buy fruit teas that aren't green teas :) I used to drink Chamomile tea all the time, lovely stuff! Supermarket own brand will be the way forward. The Twinings section has just been full of offers lately and draws me in so easily!